This is part seven of a twelve part-installment of a Beard and Stache special where we'll be breaking down the top things that each lottery team needs to accomplish this offseason in order to improve heading into the 2012-13 campaign. We covered the Portland Trail Blazers in yesterday's edition, which can be found here. Today we transition back to California to cover a young, up-and-coming team that has future plans to move out of Al Davis' backyard and into a new home in San Francisco in the coming years -- the Golden State Warriors. The Warriors have a lot of potential moves they could make in this draft, but if they ultimately decide to keep their seventh overall pick, we think it would be best to add the best low-post scorer available in Ohio State's Jared Sullinger. At 6'9" and 280 lbs (we think), Sullinger is a complete monster down on the low block. He has an exceptional post game for a guy who only spent two years playing at the collegiate level and is developing a little bit of a face up game as well. There are varying opinions on Sullinger's abilities and how they'll translate to the NBA, but we here at Beard and Stache believe Sullinger to be a rich man's Glen Davis at the very least, and there's certainly nothing wrong with that. It's too bad it had to come to this, but it's time to part ways with the seven-footer from Latvia. Golden State simply can't afford to carry the dead weight that is Biedrins' $9 million salary per year for the next three seasons. Not after he averaged a measly 1.7 points, 3.7 rebounds and one block per game. There is the option of just having him sit at the end of the bench, but what purpose would that really serve? Then you still have the problem of a guy making $9 million a year without seeing the floor. Sorry, Warriors fans, but it's time to Biedrins the door, sooner rather than later. If the Warriors decide against using that seventh overall pick to draft Sullinger (or Kentucky's Terrence Jones or Baylor's Perry Jones III), then they could combine some viable trade assets and acquire a proven NBA veteran. Rumors are swirling again about Golden State's infatuation with 76ers' forward Andre Iguodala, and joining him now are Chicago's Luol Deng, Indiana's Danny Granger, Memphis' Rudy Gay and Atlanta's Josh Smith as players the Warriors are rumored to be interested in adding via a draft day trade. It's well-known that Golden State seeks to add some defensive prowess to their small forward position, something any one of the players listed above could certainly help with. If the Warriors were to make a move, it would likely involve the seventh overall pick, another one of their two picks in the 30s, and Dorell Wright or Richard Jefferson depending on how the contract numbers worked out. Sounds like a smart move to us. In case anyone's forgotten, Golden State does have a legitimate center now. They shipped Monta Ellis to Milwaukee to acquire him. The only problem? Bogut hasn't seen an a second of floor time since changing zip codes while recovering from various ailments. That being said, all signs point to Bogut being ready to go for the 2012-13 season, which is great news for the Warriors who have long been without a legitimate center to help protect the rim against bigger Western Conference foes. Lee was one of the big free agent pickups for the Warriors during the 2010 off-season, coming over from the Knicks via a sign-and-trade deal worth an insane $80 million over six years. That deal still has four years remaining, but thankfully, thus far Lee has at least earned his money. He averaged 16.5 points, 9.8 rebounds and an impressive 3.2 assists from the power forward spot in the first year of the deal, and last season averaged just over 20 points, almost ten rebounds (9.6) and 2.8 assists. Long story short, Lee, at least in my opinion has been a wise investment so far for Golden State. I'd love to believe they could have signed him for a bit less, but what's done is done. 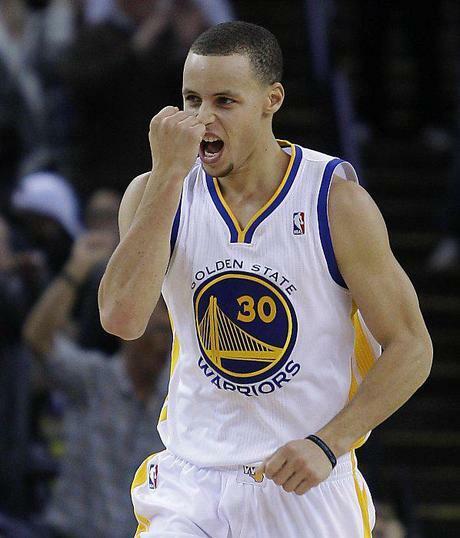 He's a 20-and-10 guy in the Warriors' up-tempo offense. As long as he can stay healthy and continue to contribute at such a high level, I don't think the Warriors will worry too much about the money.